As most of you will know from my budgeting posts, I pay pretty close attention to what I'm spending, which has been vital for my sanity post-grad, but a few other things have also made a huge difference for me, including credit cards, figuring out loan payments and prioritizing. In terms of budgeting, I've already gone over it (here), but basically, I track everything I spend in a spreadsheet, so I know exactly where my money is going. While that doesn't always hold me accountable, it helps me see that shopping sprees at LOFT = no money saved for the big things later. I can spend the money however I want to, but once it's gone, it's gone. And automatically moving savings and bill money out of the pot helps me really understand how much I have to spend. I also set up a personal savings account that I use for bigger purchases. Whatever money is leftover at the end of every pay period gets put into that account. Now, whenever I'm debating taking advantage of J Crew's most recent sale, I take a second to figure out if I'd rather spend 70 dollars now or have that money in my new lens fund. About 5 months after I graduated, I applied for my first big girl credit card - it's got no foreign transaction fees and 1.5% cash back on every single purchase. Since then, I barely touch my debit card, instead putting everything on that card. I've gotten about 300 dollars in rewards since then, which I have applied to the balance or let accumulate. Right now, I'm letting it pile up and will probably use it for a splurge around my birthday at the end of the year. I pay the full balance every month and don't use it as an excuse to over-spend, which makes the cashback feel like actual free money. I also get to build credit on my own, which will make any future major purchases even easier. 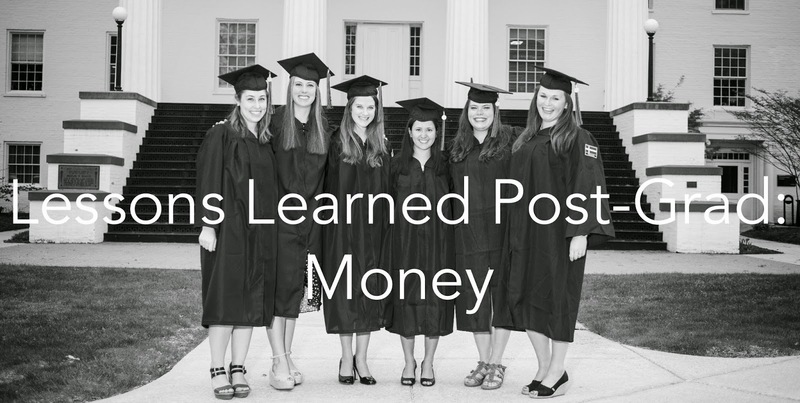 Finally, the hardest money lesson for me post-grad was figuring out prioritization. Once Tallulah came home, I realized that my money was no longer just for fun - she needed to eat and play and get trained, and I needed to have enough saved that I could cover any emergencies for she or I. Cue more serious saving. A random trick that also worked for me was to leave my credit cards at home whenever I went to work. It's where I'm most bored and least likely to actively prioritize needs, so removing the ability to immediately pay for things has limited my random purchases. I'm by no means perfect with my money right now, and the last year was a little rocky in terms of making smart decisions, but for right now, this system is working pretty well!